You are viewing the archived Prepaid Phone plans page. Follow the link to view the current Prepaid Phone Plan ratings. Compare prepay phone plan providers in New Zealand at Canstar Blue. 2degrees, Skinny Mobile, Spark and Vodafone reviewed & rated on their network coverage, customer service, value for money and overall satisfaction. * Overall satisfaction is an individual rating and not a combined total of all ratings. Brands with equal overall satisfaction ratings are listed in alphabetical order. Canstar Blue research finalised in February 2017, published in February 2017. 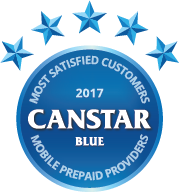 Skinny Mobile has topped Canstar Blue’s customer ratings for prepay phone plan providers for the third year in a row. Skinny received five star reviews across all categories, including billing, customer service and value for money. If you’re on a budget, or don’t like having to mess around with costly contracts and bundled phone plans, a prepaid plan can work out to be great value. They differ from other phone plans in that you pay first, load credit and then you can either top up only when you need to, or set it to ‘auto recharge’. This can work out to be pretty cost-effective, and is a great option to prevent bill shock as you only use what you pay for – once you’re out of credit, that’s it. Furthermore, if you’re happy with your current handset and think it’s just your provider that needs an upgrade, then a prepay deal can work out to be a fuss-free option. Not all prepaid plan providers are made equal. So which are doing the best job by their customers? To find out, Canstar Blue surveyed more than 1,300 prepaid phone users and asked them to rate their service provider on important factors such as network coverage, customer service and value for money. New Zealand’s four leading prepaid service providers featured in the results, but only Skinny Mobile achieved a five-star review for overall satisfaction, in addition to all other research categories. It’s the third year in a row that Skinny has taken out top spot in our ratings. 2degrees rated four stars with Spark and Vodafone both rating three stars overall. Shopping around for your next best prepaid plan deal can be a headache, but it doesn’t have to be. Start your search by learning a bit about the providers we have rated and the deals they offer. Skinny is a Mobile Virtual Network Operator using the wholesale Spark network to provide its service. As it uses a wholesale provision, savings are likely passed on to you. Its prepaid plans have memorable names like ‘Loose Lips’, and ‘Busy Fingers’. Prices start from a mere $4 or so for a 7-day plan, and 1GB plans come in at less than $30. Evidently, those surveyed were happy with all aspects of Skinny Mobile as it dominated the competition with top marks in all categories. 2degrees mainly deals in phones on a plan, however it does have a fairly concise range of prepaid deals as well. Prices start at less than $10, and many of its plans even include international calls to Australia, which could be handy. Expect fairly generous data and call rollover allowances, which could mean you have a pretty beefy plan. 2degrees was a solid performer in this year’s prepaid ratings, earning four stars for overall satisfaction, and four-stars in every category. Spark was rated three stars in every category, except for network coverage. A few of its prepaid plans come in at under $20 a month, and for this amount you can expect between 500MB and 1GB of data. You’ll also get a healthy smattering of texts and call minutes. You cannot also forget about Spark’s Wi-Fi network, with over 1000 locations nationwide, so you’ll not have to use your data for too long. With Spark prepaid you’ll get 1GB on this network per day, which is super handy. International telecom giant Vodafone has a large slice of the Kiwi telco pie, but that doesn’t mean its prepaid plans suffer in any way. A lot of plans come in at $20 and under for the month, and you will be afforded generous call minutes and data. As usual, you can expect data and calls to rollover, plus calls to Australia to be included. For 1GB, you can expect to pay at least $25 per month. The big red telco offers some solid prepaid plan options, but New Zealand customers are clearly divided, rating Vodafone three stars overall, and in every category. Prepaid is great for casual phone users, or those looking to reign in their mobile phone expenditure. Often with phones on a contract, you are paying hefty monthly bills – both for the phone itself and your selected package of data, calls and texts. These plans can exceed $100 a month! IN addition you sometimes need to pay at least some of the phone off outright – so your first month can be very expensive indeed. Prepaid is a much more budget-friendly option for the flexible and casual phone user, as you can shop around for a cheap deal, there are no contracts, and you don’t have to recharge every month if you so desire. With this flexibility, you only pay for what you use. With phones on a monthly contract, you are generally locked into the same amount of data, calls and texts for the life of your contract, often 24 months. A lot can change in two years and chances are that at some stage, you either won’t be using your entire plan, or using too much. This brings its own set of problems, either not getting full benefit or, if you go over your plan’s limit, you’ll be hit with extra charges. There will also be fees for cancelling the contract. With prepaid plans, you won’t be charged extra once your credit runs out. Instead, you can decide to ‘top up’ or, if you have an auto recharge facility, just wait until next month rolls around. But what can be an advantage, can also be a disadvantage. If you run out of credit, it can be annoying to have to consciously buy more. If you are on a prepay plan, you may also find that if you run out of credit, the next time you top-up you have to reset your plan. While some providers allow you to ‘auto recharge’, there is often still some ‘manual’ work left to be done, especially if you decide to change your plan settings. While this is great for flexibility, it can be irritating for consistent phone users. Alternatively, phones on a contract allow you to ‘set and forget’, which is convenient but can be costly as a lot of contracts are for 24 months meaning you could miss out on improved deals later on. Whichever way you decide to go, it pays to shop around and compare offers from all service providers. Skinny Mobile is the smaller operator tackling the big guys, and it represents good value on prepaid plans. But to find what’s right for you, keep an eye on the market for latest deals and you’re sure to find a plan for your specific needs. Canstar Blue commissioned Colmar Brunton to use the ConsumerLink panel to survey 2,500 New Zealand consumers across a range of categories to measure and track customer satisfaction. The outcomes reported are the results from customers within the survey group who have an active prepaid phone plan account and pay the bills – in this case, 1,313 people.